This is another of those posts where I am essentially writing a message to my future self to remind myself how to do something, and in the process perhaps help out someone else. I wanted to use the Google Sign-in for iOS Xamarin Component from Xamarin Forms to let a user sign-in to Google, and then use the resulting access token to invoke one of the Google APIs, in my case the Google Tasks API. How to use the resulting access token to actually invoke the API. 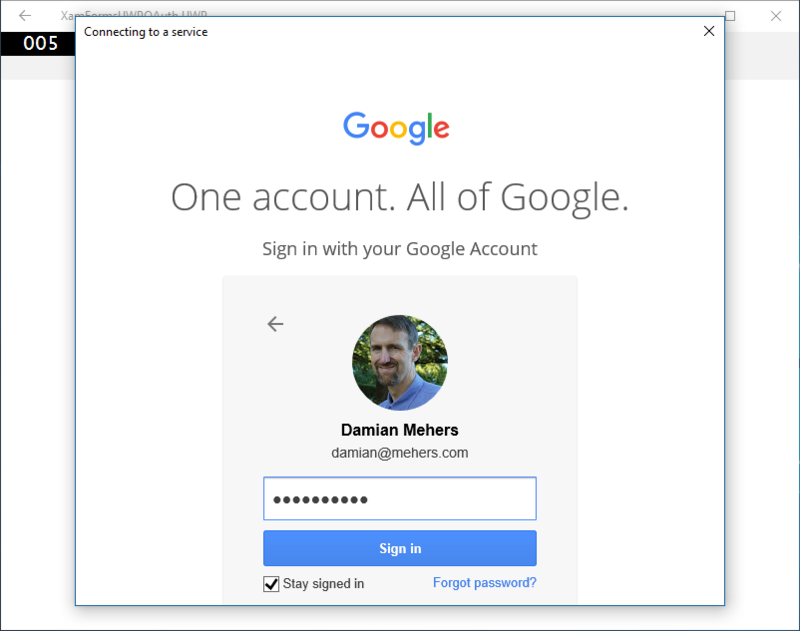 The Getting Started Guide for the Google Sign-in for iOS Xamarin Component explains how to set up the component for a native Xamarin iOS app. The instructions with regards to Signing In were trickier though, since they assume access to iOS View Controller. Xamarin Forms hides such platform-specifics, however this post on Using Custom UIViewControllers in Xamarin.Forms on iOS by Xamarin’s Mike Bluestein explains how to get hold of the ViewController by creating a custom renderer for a page. When the Xamarin Forms page called MainPage loads, this renderer gets invoked to actually render it on iOS. Since it derives from the builtin PageRender class, it doesn’t have to do any of the heavy lifting of rendering, but instead simply registers itself in the Services.GoogleTasks.Instance class in my Xamarin Forms PCL, which we will see later. Notice how the GetAccessToken does the Sign In work described in the Getting Started guide. It provides for asynchronous invocation and thus uses the TaskCompletionSource class since the sign-in completes via the DidSignIn callback. One difference from the Getting Started guide is that I’m specifying the Google Tasks OAuth Scope in GetAccessToken. In order to do this I needed to add the Google APIs Client Library nuget package. I also needed to activate the Google Tasks API for my app in the Google API Console. Notice also that in the DidSignIn I’m completing the task returned from GetAccessToken either with an exception, or with the OAUTH access token resulting from logging in. I defined this in the Xamarin Forms PCL for my project, and added the Google APIs Client Library nuget package to my PCL too. The key thing here is the assigning of the OauthToken on the request. Google have deprecated the use of Web Views to authenticate with their services and are instead requiring the use of their own libraries, such as the Google Sign-In for iOS library. 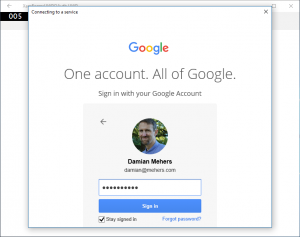 By combining the use of the Google Sign-In for iOS Xamarin Component with a custom page renderer, and requesting a custom OAUTH scope I was able to request access to a user’s Google Tasks, and then create a task. I’ve not yet explored the same thing on Android, but I’d hope to be able to register a callback from my Android code just as on iOS to do the OAUTH dance. This entry was posted in Uncategorized, Xamarin on March 20, 2017 by damian. I’ve noticed that this doesn’t work in UWP apps because the DatePicker renders as a native component, and ignores the Format. It is trivial, but does make for a nicer UX. That’s all folks, nothing more to see, move along now. This entry was posted in Xamarin on January 24, 2017 by damian. 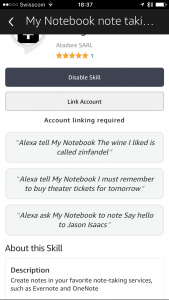 I just released my first Amazon Echo Skill, called “My Notebook”. 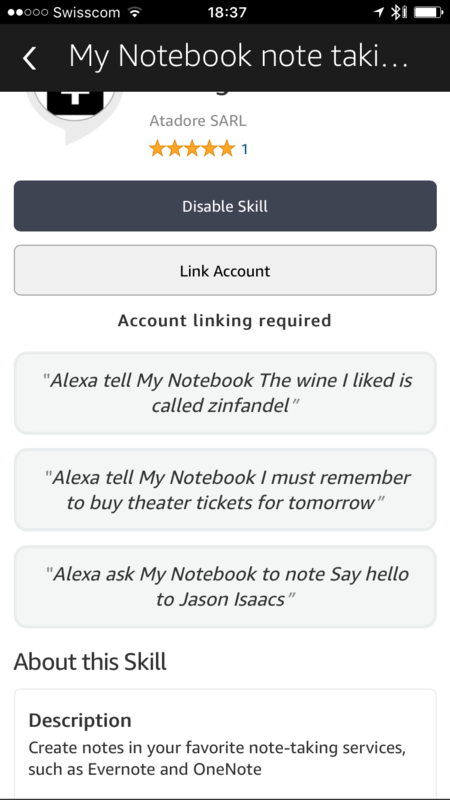 To try it out, say “Alexa, enable the My Notebook skill”. It was rejected twice (for good reasons) during the review process, and I learned a lot as a result, especially around keeping the conversation going, responding to help requests etc. For the technical, as well as using the Alexa Skills Kit, I used the Amazon API Gateway, an AWS Lambda (written in Python, since C# isn’t yet available), and Amazon DynamoDB. I’m caught between hoping it takes off, and people use it, but also hoping it isn’t too popular, since it is free and I’m not keen on maxing out my credit card! This entry was posted in Uncategorized on November 30, 2016 by damian. It’s a common scenario: You are sending data to a service, or waiting for something to happen, and you don’t want the user to interact with your form while that is happening. The naive approach is to bind the IsEnabled property on your containing Layout to a boolean property in your View Model, but you’ll soon find that IsEnabled is not inherited. 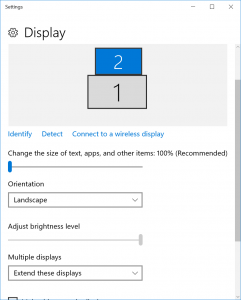 Setting it on a StackLayout doesn’t set it on all the controls embedded within that layout. You might hope that using an implicit style instead of an explicit style above would affect all views contained within the StackLayout, but it doesn’t work like that. There is also the tantalizing and undocumented ApplyToDerivedTypes Style property, but that has no impact that I am aware of. When I test the above code in an app I created, everything works swimmingly except for the Button. It doesn’t become disabled when I click it. The reason is that I am using the Command property to execute code in my View Model, and the ICommand interface to which it is bound has its very own CanExecute mechanism to decide when the Button can be clicked. I like to put my View Models in a separate class library, which has no dependencies on Xamarin Forms, but the Command class comes from Xamarin Forms. Fortunately Xamarin Forms is now open source, so I can “borrow” the Command class’ source and embed it within my class library and thus remove the Xamarin Forms dependency. The complete solution is here in GitHub. This entry was posted in Uncategorized, Xamarin on September 27, 2016 by damian. tl;dr: Complete standalone example here. I recently wanted to authenticate to Evernote via OAuth in a Xamarin Forms app I’m creating. 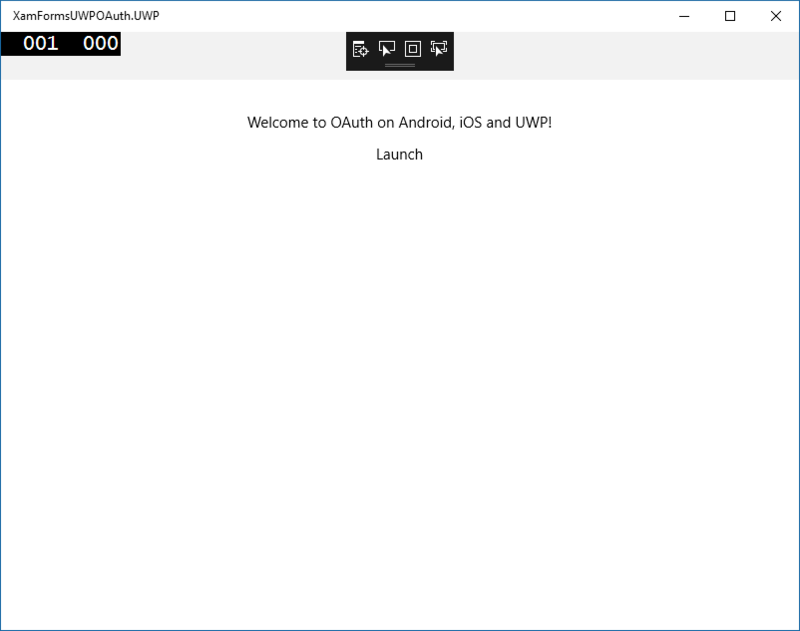 There is an excellent Xamarin plugin, called Xamarin.Auth which lets you do the OAuth dance for iOS and Android Xamarin Forms apps, but even in the latest branch, I couldn’t get it working on the Universal Windows Platform (UWP) app. Comments pointed to using a the WebAuthenticationBroker from Microsoft. There are plenty of examples here, unfortunately none for Evernote. 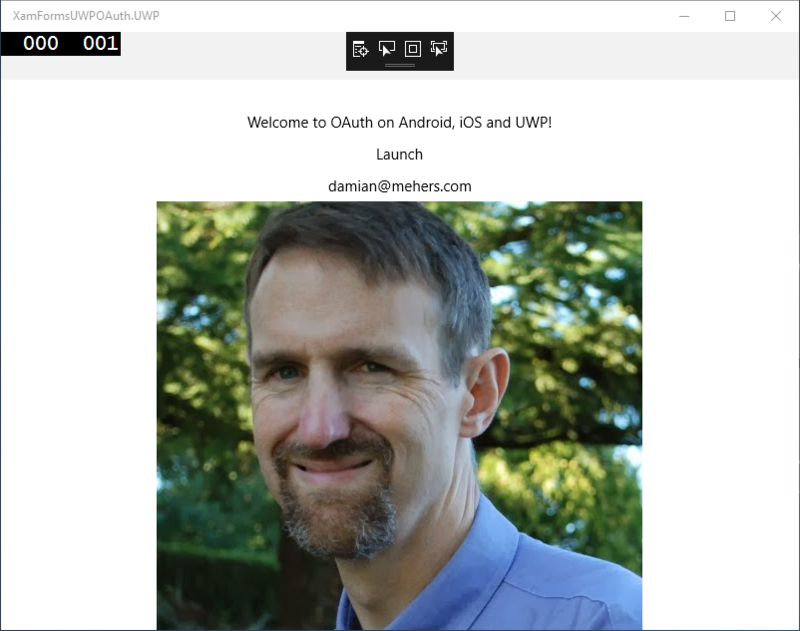 I created and published an Evernote UWP OAuth example using WebAuthenticationBroker based on the Twitter example, which was similar, but not similar enough to be able to just copy/paste. I published that example on GitHub. 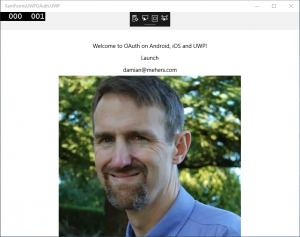 You could use one of the other Microsoft OAuth examples, or your own, in order to do the OAuth. It makes use of the Igor Kulman‘s DataProtectionExtension implementation here. 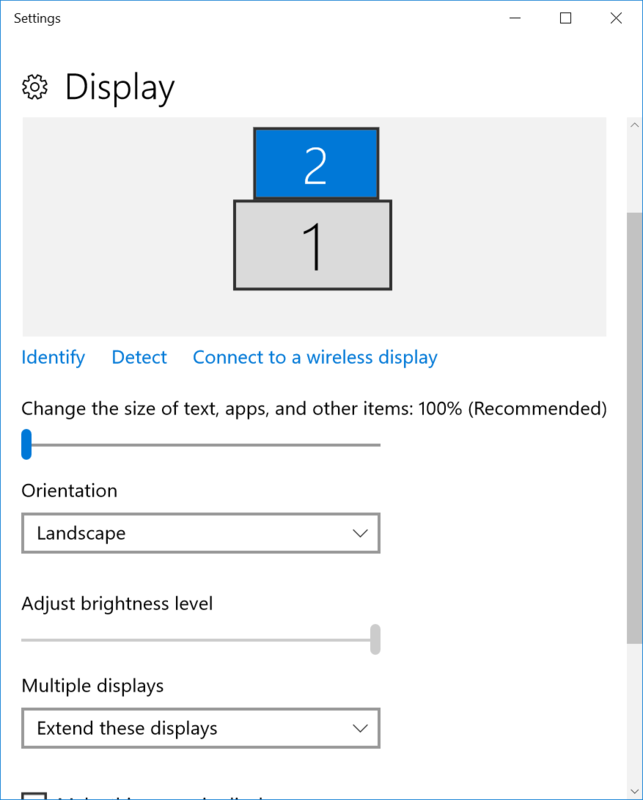 Check out the full standalone example that works with iOS, Android and of course UWP in my GitHub repository. This entry was posted in Xamarin on September 4, 2016 by damian. I’ve been getting System.InvalidOperationException: Only one operation can be active at a time in a Xamarin app I’ve created which uses the Media Plugin, and finally figured out why I was getting it. I was being spectacularly stupid. The behavior I was seeing was that when the form loaded, the camera started, I took a photo, tapped the Use Photo button and then the app crashed with System.InvalidOperationException: Only one operation can be active at a time. Can you guess why? I finally realized that after taking the photo it was re-displaying the form, causing the appearing event to be fired again, and thus causing a new photo to be taken while the old one was being taken. Hence the crash. D’oh. My clue was that I discovered that by inserting a await Task.Yield(); at the start of the LoadCommand delegate, it stopped the crash, but started the camera again after I’d finished taking a photo. The error was perfectly correct, I was causing more than one “take photo” operation to be active at the same time, I just didn’t realize why. This entry was posted in Uncategorized, Xamarin on July 6, 2016 by damian. When designing the Xaml for QuickNotePage I was pained to see that Intellisense wasn’t working, because I wasn’t setting the bindingContext for the page in Xaml. 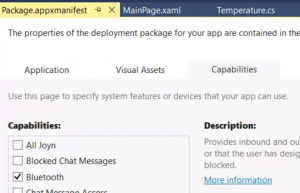 A quick search led me to this page which pre-dates the current version of Xamarin, but nevertheless reminded me of the old design-time namespaces that were auto-generated when I worked on WPF and Silverlight. Where QuickNoteViewModel is the ViewModel class, and instance of which I set above when instantiating the page. This entry was posted in Xamarin on April 10, 2016 by damian. Not sure why this is happening, but its been happening on all my installations of Xamarin with Visual Studio 2015. 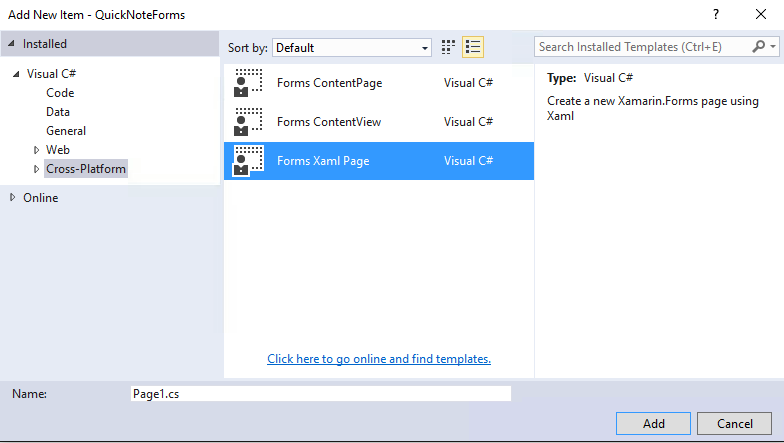 All the tutorials and web pages talk about using Project|Add New Item and adding a new "Forms Xaml Page". 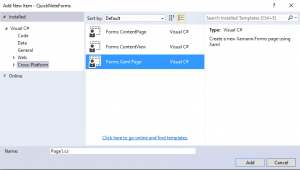 But whenever I install Xamarin and Visual Studio 2015, I just get the "Forms ContentPage" and "Forms ContentView" which just generate a C# file, no Xaml. This entry was posted in Xamarin on April 8, 2016 by damian. I’ve had a couple of TI SensorTags sitting on my shelf for a couple of years. These are the original ones, which have been superseded by smaller ones that have additional sensors for light and sound. They are wonderful devices. They last for over a year on a watch battery, they talk Bluetooth LE, and they have loads of sensors including Temperature (both spot temperature of a nearby object, and overall ambient temperature), Gyroscope, Accelerometer, Magnetometer, Barometer, Humidity, etc. Last, but not least, they cost less than US$30. 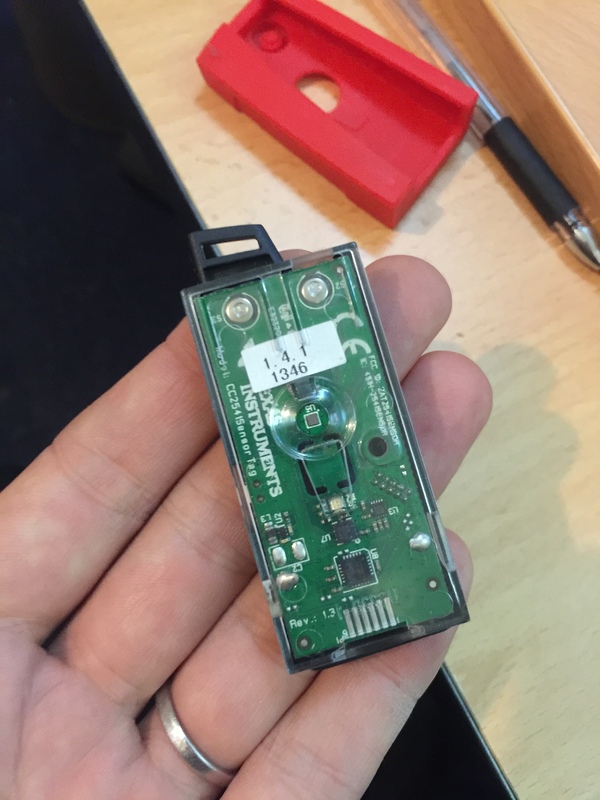 Unless you actually enjoy wiring physical sensors into an Arduino or Raspberry PI, I think Sensor Tags are a great way to start collecting all kinds of information. Rather than have a phone sitting talking Bluetooth LE, I decided I wanted to use a Mac Mini server that I have running Windows, which I could run continuously to capture, store and serve the sensor information. At each step I hit roadblocks, and the purpose of this blog post is to try to capture what I did to overcome them, in the hope that other people may benefit from my pain. I really appreciate the C# syntax and associated features such as lambdas, and LINQ. I wanted to try my hand at create a Windows app, to see how much I’d lost over the last few years. 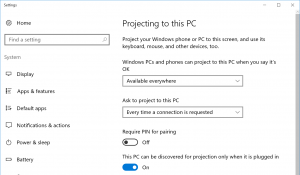 I started off creating a new Windows Universal app in Visual Studio. I browsed the documentation, and found the classes associated with using Bluetooth LE. I liked the fact that my app would be able to run on desktops down to phones. 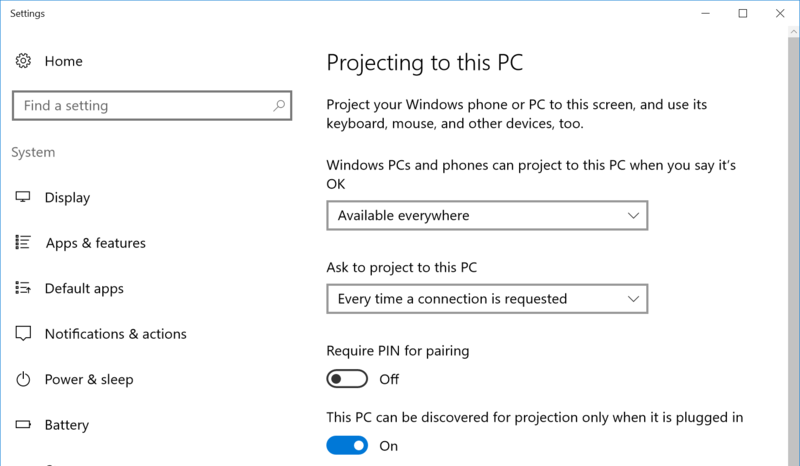 When I ran this, I got the following exception: onecoreuap\drivers\wdm\bluetooth\user\winrt\common\devicehandle.cpp(100)\ Windows.Devices.Bluetooth.dll!51D26D1B: (caller: 51D273AE) Exception(1) tid(13c0) 80070005 Access is denied. 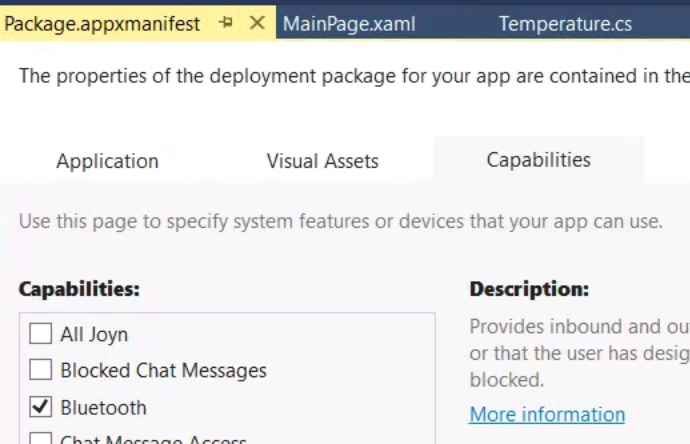 Turns out I needed to add Bluetooth to my app’s capabilities by double-clicking the Package.appxmanifest file in the Solution Explorer, going to Capabilities and checking Bluetooth. 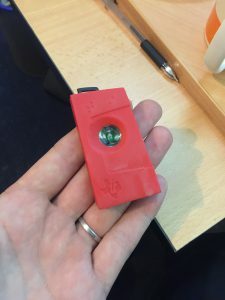 I used the Sensor Tag documentation to know about the GUIDs used for the services and characteristics. I found I needed to press Advertise the button on the side of my Sensor Tag to get it to be seen. This was supposed to be trivially easy. I’ve done plenty of WCF in the past, and know how ridiculously straightforward it should be to expose a REST service from an app. Except that Windows Universal doesn’t currently support WCF. I went searching and found Restup, currently in Beta, which aims to expose REST endpoints for Windows Universal apps. I used NuGet to install it. I had to check the Include prerelease option because it was currently in beta. Note the escaping of the question mark in the UriFormat? I wanted to pass parameters to my endpoint, rather than use values that are part of the path, but all the RestUP examples showed values in the path. I eventually came up with this solution, however it may be unnecessary by the time you read this. Additional information: Access is denied. Private Networks (Client & Server) (so that I could use my service on my home network). Try as I might, I was not able to use my local Chrome browser to access my service. I resorted to using a totally separate machine to invoke my service. I used the CheckNetIsolation tool. I ensure that the Allow Network Loopback option was set for my project Visual Studio. I turned off my firewalls. Nothing! In the end I’ll likely use the Windows Universal app to capture the SensorTag data via Bluetooth LE, and then create a Node.JS app to serve it over REST, sharing the same SQLite database, with code to handle retrying if the database is busy when inserting new values. I’ll also push the data to a Node-RED instance to act on the data. This entry was posted in Uncategorized on January 31, 2016 by damian.